In one sentence Structured Wiring can be described as combining all of the communications wiring in your home and treating it as one wiring system. This can include wiring for a home network, telephone, video, audio, alarms, infrared remote control and anything else you choose to throw in. Configurability - With all of the cables running back to the Central Wiring Panel you can easily change how and what these individual cables are connected to and what they are used for. Troubleshooting - Each of the cables can be individually isolated from the rest of them and tested for shorts and opens if need be. No splices - Splices are taboo here because they are prone to failure and can pickup noise and interference and, quite simply, aren't needed here. More consistent signal quality - with all cables running back to the Central Wiring Panel they can all be connecter to the same source and get the same signal level. You can easily avoid having some outlet passing through more splices or splitters than others. Did I mention No splices? Another feature key to structured wiring is the choice of wiring types. The use of high quality cabling is stressed here. For video this means a high quality RG6/U Quad Shielded cable is typically used instead of the older RG59. The RG6 Quad Shield has less signal loss especially at the higher frequencies used for DSS (satellite) and is less susceptible to interference. For the data network this means a high quality CAT5 , CAT5e, CAT6 or even fiber optics. For the phone this means the same CATx cable used for data instead of the older 4 conductor phone cable resulting in less noise and interference pickup and the capacity for 4 phone lines instead of 2 . The idea here is use the most advanced cabling you can afford. You may not need all the capabilities these advanced cables provide today but with home networking and entertainment evolving so quickly you may find them quite useful sooner than you think. A Structured wiring enclosure with an easy plug and play design will bring custom hidden wire management of home wiring systems right to your home. Custom Home structured wiring panels will cover and hide cables such as audio distribution cables, video cables, data cables, telephone, data, and your intercom wiring out of sight, but never out of your reach. Hide your whole house structured wiring cables, in a conveniently organized location. With push-and-lock modular components for cable management, structured cable enclosures, will allow for endless possibilities in wiring panel installation. 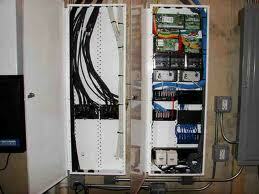 Questions You Want to Ask Your Self When Planning Structured Wiring System? What type of internet will you use? How many locations would you like for active internet? Will you be using CAT 5e cable or CAT 6 cable? Will you be creating a wireless network as well? Will your security system be tied to your telephone line? Would you like to be able to switch wall outlets between voice and data? Will you have cable TV or satellite service? Whole House Distributed Audio Questions? How many basic zones (left and right speaker, one volume control, indoor - does not include home theater/surround sound area)? How many small or bathroom zones (locations where there may be room for only a single speaker)? Will there be an area with surround sound? Let Advanced Home Control's (AHC) take all the confusion and guess work out of designing and creating a multi media home of your dreams!